I posted the information below in a thread concerning a news article about alleged mass graves at Treblinka filled with corpses of Jews. Concerning this shoddy attempt to refute revisionist scholarship, it is stated in the news articles, and is stated routinely, that the excuse for not actually excavating and exhuming the corpses of that or any of alleged mass grave sites, where identities, cause of death, when death occurred, etc. could all be established, is because it is forbidden by Jewish law. Naturally, logic would tell me that one must identify the corpses to see if they were indeed even Jews. I would like to open a discussion on what I call The Big Excuse. Do others have information that it is forbidden to actually excavate and exhume Jewish corpses? The information below tells me that this simply is not true. What appears to be required is essentially having a rabbi at the site. And of course, there must be payments made, no surprise there. Imagine, this would mean that any grave claimed to hold a Jew could not be exhumed. Think of the implications for solving crimes where exhumations are regularly ordered by courts. Do Jews protest when a court orders an exhumation of a grave where a Jew is claimed to buried? And since the entire matter seems to be an attempt to silence the growing number of Holocaust revisionists, certainly getting a rabbi to stand by would not be a problem. Wouldn't the Chosen Ones want their sacred "Holocaust saints" exhumed and reburied in holy Israel as is mentioned in my quotes below? Wouldn't they welcome the opportunity to strike a blow against the growing suspicion concerning the Holocaust "storyline"? What first must be determined is whether in fact the alleged mass graves are actually mass graves. Then it must be determined whether the occupants of any such mass grave were murdered. Then, if it is proven that the occupants were murdered, it must be determined who the murderers were. And as I said before, it must be determined that the anyone proven to be murdered were in fact Jews. The Big Excuse for not doing this is in fact a cover for the lack of proof for the "Holocaust" mythology. Any thoughts from those at this forum? DO YOU OR YOUR LOVED ONES WANT TO BE BURIED IN ISRAEL? Achuzat Kever helps Jewish families, worldwide, bring their loved ones to their final resting place in Israel. We also arrange exhumations anywhere in the world for the purpose of transferring the mortal remains to Israel. English speaking, we take care of everything from reserving a burial plot, transport of casket to Israel, officiating at funeral service, arrangement and 'perpetual' care of tombstone. Full information, with pictures and plans of cemeteries available. Reserve a plot anywhere in the Holy Land — Jerusalem, Beit Shemesh, Haifa, Zfat, etc. Fair, affordable prices — protecting your interests in bringing the cost of funerals within reach of everyone. Based in Israel, we deal with all local issues, making it easier for families at the time of their loss. If required, we will arrange kaddish to be recited for the mandatory period. Someone to turn to 24 hours a day. Approved by Hagoan Rav Chaim P. Scheinberg (shlita). In accordance with Israeli health regulations, remains of persons of the Jewish faith may be disinterred a year from the date of burial. There is no law prohibiting disinterment of remains of persons of other faiths at any given time, provided that the Ministry of Health is in agreement. Exhumation must be performed in the presence of a representative of the Israeli Ministry of Health. The Ministry of Health, having given the necessary permission for exhumation of remains, must also obtain the consent of the Chief Rabbinate of Israel for exhumation of the remains of persons of the Jewish faith. For exhumation of the remains of persons of the Muslim faith, the consent of the Islamic High Council is needed, and for exhumation of persons of the Christian faith a Church consent is required. The Jewish Burial Society is responsible for exhumation of remains. Remains that are to be shipped out of Israel may require embalming, depending on the stage of decomposition. Always lame excuses. And we're still not seeing any images. Just Google "jewish cemetery moved" and they pop up like crazy. Also the Google News section has some cases too. The only thing I came up with that discusses the "law" is in this link. If it is believed that valuables have fallen into the earth that was used to fill in the grave. If a very large sum of money was placed on the casket, or if the deceased was wearing very expensive jewelry that was somehow not removed before burial, and the survivors are indigent, or creditors will have to take great losses because of lack of funds. If the remains were not prepared according to religious law, disinterment may be possible if this was realized shortly after burial. If the body was not identified accurately before burial, thus preventing the wife's remarriage for fear that her husband yet lives. The truth fears no question. So that's it then. Jewish remains can be removed. The most obvious reason is if they have not been prepared according to religious law. This would surely cover those 'gassed'. So as we now know this could have happened and presumably could still happen. But that would expose the lies, as digging up Treblinka would let the genie out of the bottle. They would be digging away day after day looking for 800,000 bodies and would find exactly how many??? borjastick wrote: They would be digging away day after day looking for 800,000 bodies and would find exactly how many??? Not quite, Borjastick. The cremated remains of 800K bodies and/or the disturbed earth of the pits where 700K had previously been buried. Kingfisher, must be me but I don't understand the point you are making. Are you saying they would find cremated remains of 700,000+ or not? That's the obvious reason (preparation for burial) you would think that they would want to dig up the remains to prepare them properly and to identify them. borjastick wrote: Kingfisher, must be me but I don't understand the point you are making. Are you saying they would find cremated remains of 700,000+ or not? From memory, the current story is that they buried 700K then dug them all up and burned them, and went on to kill 170K more and burn them directly, for a total of 870K! That's about 10 Wembley stadiums full. Not to concentrate too much on Treblinka, but the laughable claim is that the Germans exhumed the alleged corpses then reburied the remains, meaning of course there would still be tons of Jewish remains. "The mass graves were opened and the corpses were taken out, to be consumed by the flames of huge pyres (the ‘roasts’). The bones were crushed and, together with the ashes, were reburied in the same graves." 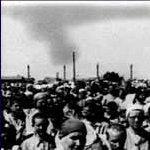 TREBLINKA: EXTERMINATION CAMP OR TRANSIT CAMP? Mattogno/Graf, 2004, 2005, 2011, p.15. Recall that when there are bombing attacks in Israel how they run around looking for every minute piece of human remains they can find. But for the 'holocaust, where they claim to know precisely where enormous mass graves are, they make obvious and embarrassing excuses for why they won't retrieve them. We also know that the man whom was said to be responsible for exhuming Jewish corpses and magically hiding them, SS Blobel, cleverly stated during his, ahem, "confession" that he did not get to many of the allegedly known mass grave sites, so according to the storyline there should be endless, uncremated Jewish corpses to exhume all over eastern Europe. Owing to the moving up of the front-line it was not possible to destroy the mass graves further south and east which had resulted from executions by the Einsatzgruppen. Blobel knew he had no chance, so he clearly sowed a seed that is now being harvested. The simplest way to put it is that the lie that the Germans supposedly hid all the corpses falls apart because there are no corpses. And by accusing and then using Blobel's statements, (Jewish supremacist leave out the part that I quoted) the 'holocaust' Industry has shot itself in the foot again. Breker, great thread. Thanks for starting this. I hope that it can be kept up to date, and developed as a resource. It's getting a permanent bookmark from me. We've had some prime sources posted already. I just want to add a handful more. And yet as is so often the case, we the Jewish people are our worst enemy. The very activity which, if undertaken by others would elicit the sharpest of protest, is taking place on our land by our people. The relatively few who actively try to stop this desecration are derided as fanatics and extremists who glorify the dead over the "needs" of the living though those "needs" may be no more significant than the construction of an underground parking garage. Indeed, if there is any chance at all to induce the Israeli government to impose stricter controls or restrictions on what is presently a virtual carte blanche to indiscriminately excavate any ancient sites for any purpose, it is essential that it perceive the issue as being more than a problem that bothers only a small segment of the ultra Orthodox. At least until the Peres announcement, however, it had been the Israeli government's position that the Antiquities Authority was authorized to grant such permission through its licensing procedure. In effect, this created a Catch-22; any excavation which had been duly licensed under the Antiquities Act - and such permits have never been hard to obtain - was by definition done "with permission" and could not be attacked through the Penal Code. It should also be noted that the issue is not merely the excavation and relocation of bones to alternative burial sites; it has been reported that in a number of cases, bones have simply been scattered or dumped, an unpardonable desecration of kavod hamet which cannot be allowed to occur under any circumstances. As the references to Peres and Rabin (PMs of Israel in the mid-90s) indicate, the article itself is some fifteen years old. So who knows? Maybe Rabbi Breitowitz and Friends have made some headway since then. But note that, at the time anyway, "The relatively few who actively try to stop this desecration [i.e., the disturbance of Jewish graves]" apparently were regularly "derided as fanatics and extremists" by mainstream Israeli society. Breitowitz whines that "it is essential that it [the government] perceive the issue as being more than a problem that bothers only a small segment of the ultra Orthodox"-- which is another way of saying that most Jews just don't give a damn, no? Are attitudes likely to have changed all that much since then? And finally, if "in a number of cases, bones have simply been scattered or dumped"--in Israel!!! by Jews!! !--and if this really is "an unpardonable desecration of kavod hamet [dignity of the dead] which cannot be allowed to occur under any circumstances," what possible rationale can there be for not recovering the bones that those evil Nazis just "scattered or dumped," and bringing them to Israel for a proper Jewish burial? Whatever the reason for the prohibition, the exceptions to it are few. . . . Disinterment is also permitted in order to bring a met [deceased] to Eretz Yisrael or to kever avot (burial plot of his ancestors). True enough, there does seem to be a "prohibition" in Jewish law--or at least in the minds of a certain subset of Orthodox rabbis--against disturbing Jewish graves. But apparently it doesn't get much respect even in Eretz Yisrael itself. Maybe they don't want to move the Jewish dead from Treblinka, etc., for reburial in the Homeland because they're worried some real estate developer in Haifa will want to build a parking lot over them someday? What else could it be? What are they waiting for? A Frank Gehry-designed museum can rise in Jerusalem on a site that was once a Muslim cemetery, Israel's Supreme Court ruled today, clearing the way for L.A.'s Simon Wiesenthal Center to build a Holy Land counterpart to its Museum of Tolerance on Pico Boulevard. The $250-million project had been delayed since early 2006, when builders unearthed bones. Arab leaders in Israel sued to stop the project and were supported, in an unusual alliance, by some ultra-Orthodox Jews with firm beliefs against disturbing graves. Rabbi Marvin Hier, dean of the Wiesenthal Center, said in a statement Wednesday that "moderation and tolerance have prevailed." But Zahi Nujidat, a spokesman for the Israeli Islamic movement, decried the ruling as "clear religious and ethnic oppression," according to the Associated Press. The Supreme Court's ruling requires museum builders to consult with Israel's Antiquities Authority on how to rebury any remains unearthed during construction and on creating a barrier between graves and the building's foundation. The court found that the cemetary dates back 300 to 400 years but fell into disuse after Israel gained statehood in 1948. The court said that since there had been no objections in 1960, when the city built a parking lot over part of the cemetery, it would not block construction of the museum on the same property. And with reference to Palestinians who have filed legal actions and persisted in expressing anxiety over their families' remains, Hier had this message just last month: "The case is over; get used to it." Now there's a man revisionists could learn from. Chutzpah! We only need to change one word, then take it to the world: "The hoax is over; get used to it." WARSAW — With the main rabbi of the Polish capital watching, workers removed soil Thursday from a mass grave of Jews in preparation for an exhumation to determine how many people died. Poland's Jewish community reluctantly accepted the government's decision to exhume the bodies of Jews massacred nearly 60 years ago in the northeastern town of Jedwabne as part of an inquiry that also will examine whether anyone should be criminally charged. Jewish law allows exhumation only in very rare, extreme cases and under strict conditions. The massacre was long remembered with a memorial that falsely blamed the Nazis for killing about 1,600 Jews in the village. A book published last year disclosed that the slayings were carried out by the victims' Polish neighbors. Ah, you see, now that changes everything. We can't falsely blame the Nazis for killing 1,600 Jews when there's the possibility that "the slayings were carried out by the victims' Polish neighbors" instead. And why would that be important? (To expand the reach of the reparations-collective guilt machine to the Poles, perhaps?) Whatever the reason, apparently it is ok to exhume Jewish mass graves after all. If it's acceptable to dig at Jedwabne in order "to determine how many people died" there, then it has to be acceptable, for the same reason, to dig at Treblinka, Sobibor, Belzec, Chelmno, Majdanek and Birkenau. But then of course they're afraid of what will--or rather won't--be found, aren't they. I also think this is a very important thread, Breker, and thought so as soon as I saw it. I haven't researched to find any new information to add, but the whole Jewish religious burial rules are just what you call them: a convenient excuse, when they need it. It should be taken away from them and then we could get somewhere. So I see this as high-priority, as Kladderadatsch has expressed. It's true that rabbis have to be paid for every service they provide. They therefore dreamed up a lot of "services" they are required to bless or oversee. Just about any Jew can become a rabbi; I think they basically only need another rabbi to approve of them. There are more rabbis in the Jewish communities that we would ever realize. Many don't work at a synagogue. I worked at a hotel that hosted a Passover convention every year and they gave out pins that every "rabbi" had to wear when not in their rooms so that all the staff at the hotel would know to called them Rabbi instead of Sir. They had a team of Rabbis come in before the guests arrived and they did a huge ritual throughout the hotel and educated the staff on things to do and not to do, down ot the point of we were not allowed to eat certain things while the convention was in the build, like 5 or 6 days I think. Well I guess you know how well the dietary part of the rules went over, especially for those of us on the graveyard shift who only had one store open near us all night and they had a very limited choice of "Kosher" foods. We didn't even bother to try to hide the fact that we were going to eat whatever we wanted and if they had a problem with it they could talk to the Union and to a lawyer if they harassed us. Never heard a word about it but they had a "Rabbi" come in every morning as we left to re-bless the office area since we had "violated" it. All I could think when they gave us the rules was "What nerve..."
And the "supposed" holocaust of 6 million jews is not rare enough or extreme enough? Or is it just not convenient enough to the storyline? Nothing was found here either, but that is not the issue, digging is. Why then no proper investigation, what are the promoters of the story afraid of? Why not invite experts to come and investigate if all is “obvious”? Incidentally, "Nothing was found here either" means just that, nothing. Jamlitz, Germany - Excavations of what had been thought to be a mass grave in eastern Germany with the bodies of Jews murdered by the SS at the end of World War II have yielded no bodies. A three-week dig near Jamlitz, 55 miles southeast of Berlin, has found evidence of forced labour camp on the site. “But no human remains were found,” Geert Piorkovski, spokesman for Brandenburg state government said. The bodies of almost 600 others killed on February 3, 1945 were discovered only accidentally in a gravel pit near Staakow around eight kilometres (five miles) away from Lieberose on two separate occasions in 1958 and then in 1971. But then, no one has ever denied that there were mass executions at various times and places during the war. The key point, for the larger question of "Holocaust" research in general, is just to note that, whether human remains were located or not, forensic excavations have been allowed in the past, and therefore there is no reason why digs should not be allowed in the future. The excuse that "Jewish religious law forbids disturbing burial sites" is a flimsy lie. For more on the Jamlitz dig, http://www.spiegel.de/international/ger ... 44,00.html. Curious that we do not see any 'Believer' responses to this post. It is they who make the claims that exhuming Jewish corpses is forbidden and therefore they try to dodge the 'where are the alleged mass graves' debate on a phoney religious basis. 'Holocaust Memorial Day Lecture at Staffordshire University"
Mrs Caroline Sturdy-Colls claims non-invasive techniques were used in her bogus study due to 'Jewish sensitivities'. IOW, don't dare dig for you will find nothing that confirms the allegations. The 'Jewish sensitivities' excuse is just that, an excuse, as shown in this thread's contents.